If you’re seeking to improve the width and thickness of your biceps… Then you need to use this workout. When it comes to building bigger biceps, I think it’s fair to say that most of us don’t just want a well-developed biceps peak. But is this even possible in the first place? Well, although it’s true that genetics will play some role in this and that bigger biceps in general often results in wider biceps as well, there are a few key things you can do to further improve the width of your biceps. And to learn what these things are, we need to first take a look at the anatomy of the biceps. 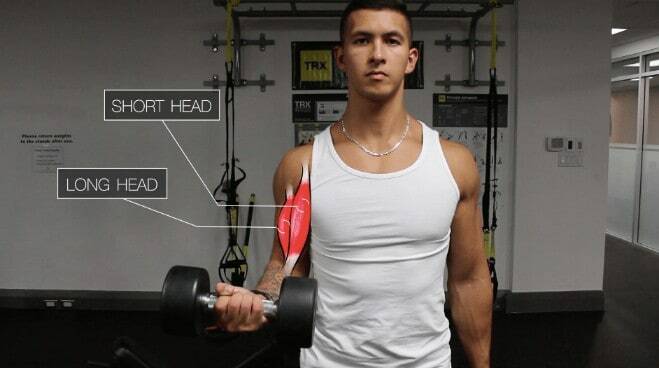 And you can do so by emphasizing the biceps head that is currently less developed on you! For example, the short head of my biceps has always been far more developed than my long head. It wasn’t until I started prioritizing the long head that I started to see a considerable improvement in the overall width of my biceps since the outer head was now larger. With 58% answering the long head and 42% the short head. So it’s clear that the long head does tend to be less developed with others as well. But, there is still quite a bit of variation, therefore in this article I’ll show you exactly what to do in either case. This muscle is not only responsible for some of the mass of the outer arm but it ALSO anatomically pushes up the biceps. This basically creates the illusion of a wider-appearing arm – which is exactly what we’re aiming to accomplish. So with that being said, let’s take a look at a workout you can do to improve your biceps width, by first prioritizing the brachialis and then working on your less developed biceps head. 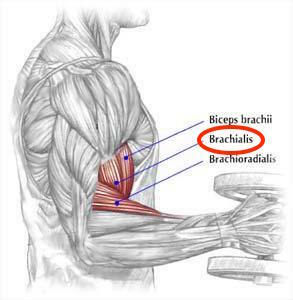 Unlike the the biceps, the brachialis muscle only has one purpose and that is to flex the arm. You want to flex your arm with a pronated or neutral grip when curling which will shift some of the work away from the biceps and onto the brachialis. By slowing down the eccentric portion of the movement, you’re actually able to further decrease the involvement of the biceps and increase that of the brachialis. The researchers speculate this phenomenon is due to the structural and fiber type differences between the brachialis and the biceps. Read More about it in my article on slow reps vs fast reps. This will just enable you to isolate the brachialis that much more. 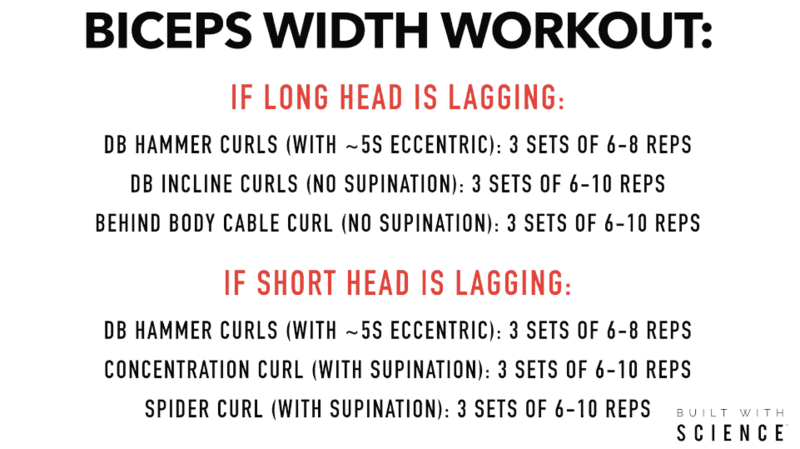 Next, if your long head is lagging behind, then what you want to do is start implementing exercises that preferentially target this head. 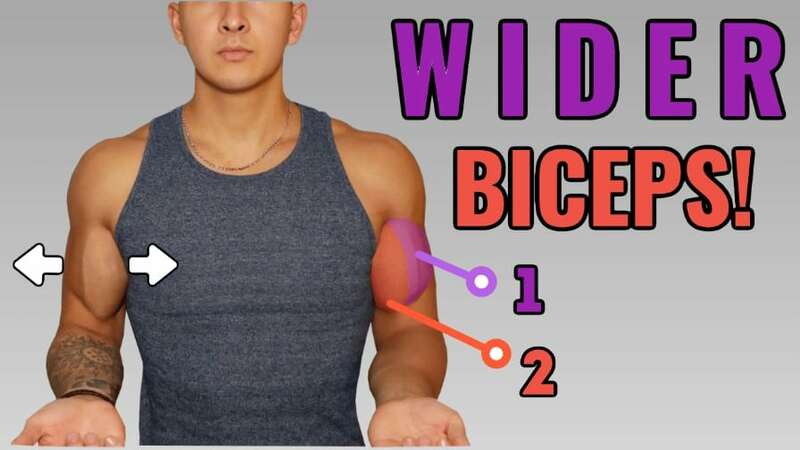 Any biceps exercise where the upper arm is held behind the body will favour the long head since it crosses over the shoulder joint whereas the short head does not. 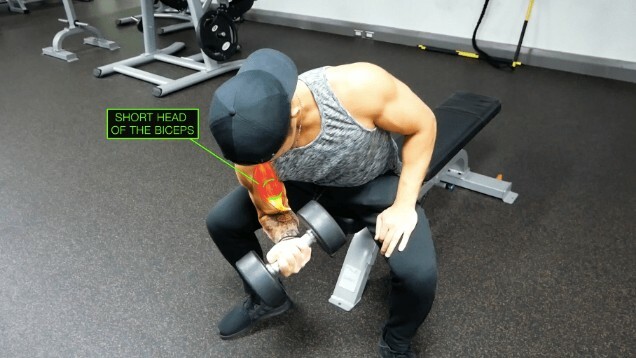 During the incline dumbbell curl the biceps are most active in the final 1/3 of the movement when the arm is fully flexed, since there is less resistance during the beginning portion of the movement due to the position of the arm relative to gravity. Therefore, you want to pair this exercise with something like the behind-the-body cable curl. This exercise not only preferentially targets the long head as well given the position of your upper arm, but ALSO has a more complete resistance curve due to the constant tension from the cable. Now in terms of emphasizing the short head, we simply reverse what we did for the long head. Any biceps exercise where the arms are held in front of the body will preferentially target the short head more while lessening that of the long head. But in addition, of particular importance for the short head, you want to also keep another tip in mind. So to further preferentially hit the short head, you want to ensure that you’re supinating your wrists like so during each rep. You can do by simply thinking about twisting your pinkies towards the ceiling as you curl. Again, focus on locking the elbows in place and supinating your wrists as you curl in order to best hit the short head. You can either perform this as a workout on its own or simply replace your current biceps isolation exercises with these instead. Either way, by implementing this into your routine you’ll be able to successfully add the much needed width and thickness to your biceps that you’re after. And for those looking for a step-by-step program that combines both scientific literature and our knowledge of the human anatomy in order to transform your body as efficiently as possible…. Then get started today and use my start-point identification quiz here which will determine what approach is best for you. Anyways, hope you all enjoyed this article! Feel free to let me know if you have any questions down below. And give me a follow on Instagram , Facebook , and Youtube where I’ll be posting informative content on a more regular basis. Cheers!